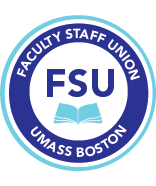 When the FSU and the other UMass Boston unions wanted to play a video message to graduates at Commencement, the Administration rejected our video. Apparently, our message was a little too subversive for them. So just what was the inappropriate message that the Administration didn't want graduates to hear? See below to find out. Tell us about Scholars for Social Justice—what does the group do? Scholars for Social Justice is a group of academics who are invested in social justice and are interested in fighting corporatization both inside and outside of the university. We’ve currently got just over 300 members and they come from all over the state from Amherst to Boston. We try to amplify their voices and connect them to opportunities for activism on issues that matter most to them. On Tuesday, March 5th, hundreds of students, faculty, and staff from around the state, including a large contingent from UMass Boston, gathered at the State House for the Public Higher Education Advocacy Day. Their goal was simple: tell their legislators to support Governor Patrick’s proposal to increase public higher education spending by $152 million in 2014. The Campaign for the Future of Higher Education, which held its second national meeting at UMass Boston in November 2011, will be holding its fifth national meeting in Columbus, Ohio, May 15-17. The CFHE has been very active since the 2011 meeting here and continues to grow.